It might be the perfect month to take a road trip. The arrival of September means temperatures are dropping, crowds are dwindling, and airfares are getting cheaper. You can still enjoy the beauty of summer, just as fall colors begin to arrive in some areas. With some strategic planning, you can put together an excellent September road trip. Here are a few suggestions. 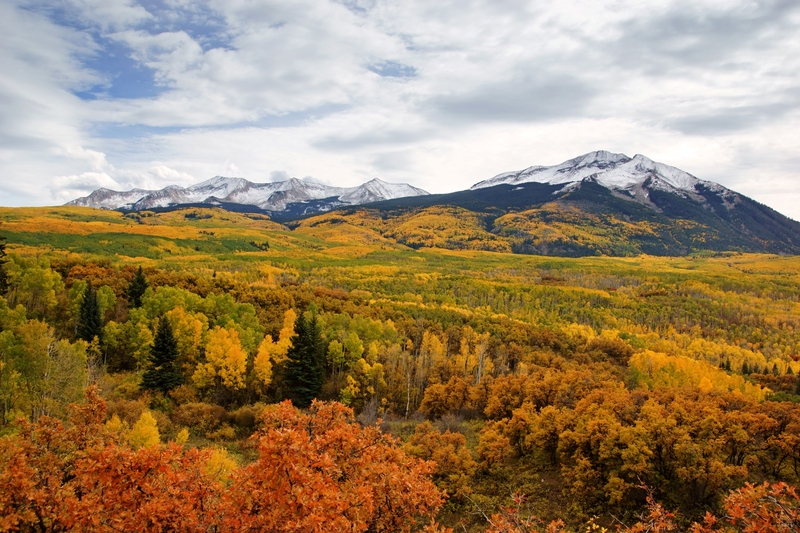 Colorado’s high elevations ensure the early arrival of fall. And believe me, fall in Colorado is simply spectacular. Sure, you won’t see the deep reds of maple trees like you would in New England. But, you will witness aspen trees turn from green to yellow to orange, as far as the eye can see. Your best bet for fall colors in Colorado comes in late September or, if nature is running late this year, the first week in October. There are no guarantees, but the last week of September is often the peak of the leaf-peeping season. You’ll want to check out areas like Kebler Pass, pictured above. It’s a dirt road on the way to Crested Butte. Some scientists believe this grove of aspen comprises the largest living organism on earth (or at least, the second-largest). The aspens are also stunning at the iconic Maroon Bells, as well as Marble, Colorado and the San Juan Mountains. Arrive a little later, and you might want to focus on lower elevations, like Roxborough State Park near Denver. Denver provides a great starting point for a September road trip into the Colorado Rockies. If it’s too expensive, you might also want to check flights into Colorado Springs, Grand Junction, and Telluride. Don’t forget to check rental car rates, as well. It’s all about fall colors. The final two weeks of September are unforgettable. There’s nothing quite as memorable as a drive up the Icefields Parkway in the summer. Unless of course, you add a splash of fall colors. The Canadian Rockies don’t have a lot of deciduous trees, but they do have Larch — a pine tree with an unusual characteristic. Each fall, Larch needles turn yellow and fall, just like leaves. A few weeks of Larch Madness is the result, as visitors arrive to catch a glimpse. I saw a few yellow larch, but not a lot, when I visited in early September, a few years back. I probably should have aimed for the second half of the month. Even so, the ground cover was already bursting forth with color at Sunshine Meadows in Banff National Park, a ski area with excellent hiking trails during the summer. You’ll want to do some hiking around Lake Louise and check out Banff’s Vermilion Lakes while you’re in the area, then take the drive up the Icefields Parkway, and maybe even walk on a glacier, before arriving in Jasper, Alberta. Calgary is just a short drive from the mountains, and towns like Banff and Lake Louise, as well as the southern end of the Icefields Parkway. Edmonton might provide cheaper flights or rental cars, but it will require a longer drive to the mountains. Reduced crowds, and slightly cheaper (hopefully) accommodations combine with Larch Madness and the fall colors in the Canadian Rocky Mountains. 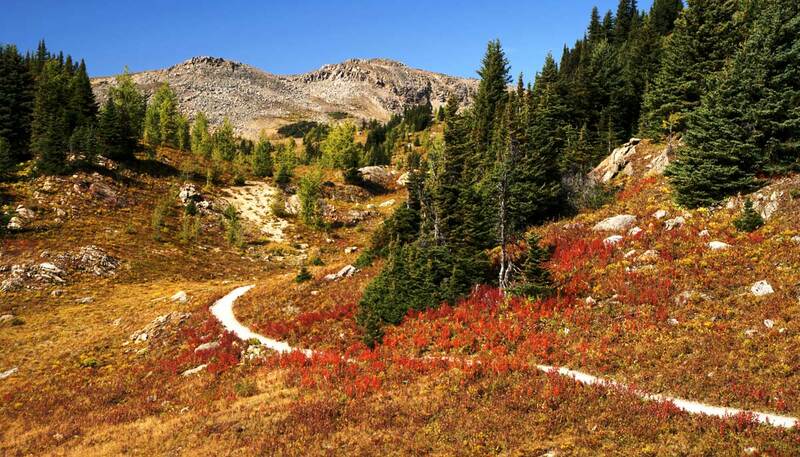 You’ll find some of America’s most stunning scenery in northwestern Wyoming. Not only can you visit the geysers and canyons of Yellowstone, but humble Grand Teton National Park is also there, on the way from Jackson to Old Faithful. This park should be considered much more than a scenic stop-over, though. 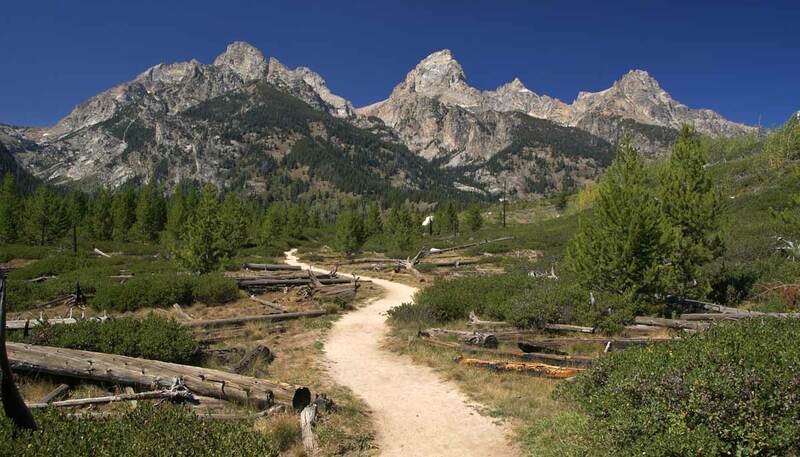 Hiking opportunities abound, and those Tetons are simply awe-inspiring, thanks to the relatively low elevation of the surrounding land (in other words, there are no foothills, just big mountains rising from nowhere). You’ll want to check out hikes like Jenny Lake and Taggart Lake, and views like Oxbow Bend. So why take a September road trip to the Tetons? Fall colors, of course! The mountains are surrounded by aspens that will start to turn by mid-September. The show will mostly be over by the first week or two of October. As a bonus, the crowds start to dwindle as the summer season comes to a close. This can make a big difference in an area that’s more popular than, arguably, it can handle. Salt Lake City provides the closest big-city access. It’s about a 280-mile drive up to Jackson, Wyoming, and it’s a beautiful drive. Jackson itself (JAC) is served by several big airlines, but you’ll probably pay more. Also consider checking Idaho Falls (IDA) and Billings (BIL). Visitors to Grand Teton National Park drop from the 700-thousands to the 400-thousands between August and September. They drop drastically again into October, but by then, you need to start worrying about snowstorms. So, September should offer the best balance between crowds and good weather. Jackson is expensive, though, so don’t expect any big discounts on lodging. Autumn colors will begin appearing throughout the park by mid-September.